2012 – I fell in love with Russia from afar when I was a child. Fate brought me to live there from 1977 to 1980, and I continued a dysfunctional love affair with her culture. When I first wrote this memoir twenty years later, in 2000, it was an expression of hope. Hope had seen me through those three years in the Soviet Union, and I wanted to record that for whoever needed to hear it. In 2000, the USSR as we knew it had collapsed, and the Russian and Ukrainian citizens that I had known were facing the task of founding a democratic society for the first time in their histories. Now, a dozen years later, the task is still ongoing, and the news out of Russia is that voices from the people are being heard as never before. The older generation that I had met in the ’70s had seen their hopes for a benevolent communism dashed. The bright young adults of that time, conditioned to serve the state, are having to ask questions and make decisions about their leadership that were never possible before. So much has changed. So little has changed. My little memoir seems timely again, another small voice from the street. 2000 – Hope drove this memoir, as hope drove the journey described here. It was an outer journey to Russia and back, and it was an inner journey through despair. 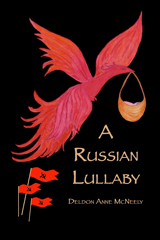 The purpose in telling this story is to contribute something, however small, to the understanding of a woman’s feelings and thoughts about pregnancy, and to contribute something, however small, to the understanding of Russia’s journey toward stability and security, her rich culture and the courage of her people fully recognized and appreciated in the family of man. Deldon Anne McNeely is a mother and psychoanalyst who writes about her family’s experience of life in the Soviet Union during the Cold War years. She is also the author of several books on the subject of archetypal psychology.